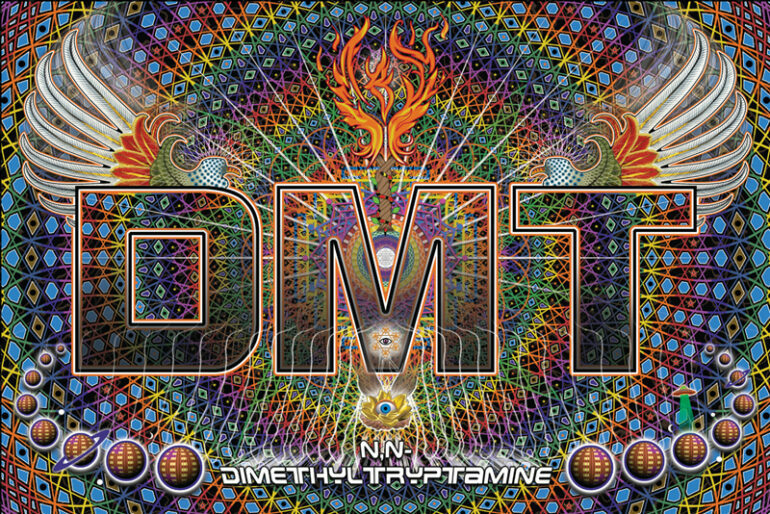 DMT, or N,N-dimethyltryptamine, is a hallucinogenic chemical found naturally in the human brain and many plants. It is the main ingredient in Ayahuasca, the South American shamanic brew used for centuries by indigenous cultures for spiritual divination and religious ritual. Depending on how it is processed, DMT can come as crystals, powder or a soft clumpy material. It often has a yellowish-orange-pink or brownish color, and a distinctive odor similar to mothballs. In Ayahuasca, a plant containing DMT is boiled together with a second plant containing a monoamine oxidase inhibitor (MAOI) such as harmaline, and the brew is consumed orally. The MAO prevents the stomach from breaking down the DMT, allowing it to enter the brain. Ayahuasca is almost always consumed ritualistically in a group, with a trained guide or “shaman” who prepares and administers the brew. Because Ayahuasca contains an MAOI, it is important to discontinue all medications at least two weeks prior to using. Effects from ayahuasca are felt within 20 to 60 minutes and last 2-6 hours. Lingering after effects can last many hours longer. Crystallized DMT can be smoked or injected, bypassing the stomach and directly entering the brain. Most people smoke DMT by vaporizing it in a glass pipe. It can also be mixed with parsley, mullein, or cannabis and smoked directly. What are the effects of DMT? Effects from smoking DMT are felt instantly. Peak effects last about 5-10 minutes, with mild to moderate residual effects lasting 30-45 minutes. Even with low doses (one inhalation from a pipe), users report intense visuals. The environment may look like an animation. Faces can appear like cartoon masks. Colors shift and change. Auditory hallucinations are also common, but less intense. On higher doses of smoked DMT (two to three deep inhalations), profound experiences can occur. Users report visiting other worlds and talking with aliens or beings from other dimensions. Often these beings are benevolent, elf-like creatures. These experiences can be inspiring and transformative, or they can be overwhelming and terrifying. Total ego-dissolution is common. Time stands still and the user loses all sense of separateness from the universe. After 5-10 minutes there is usually an abrupt return to baseline, although the user can be “taken back” momentarily a few more times during the come-down experience. The rapid onset and extreme intensity from smoking DMT can be overwhelming. Do not be fooled by the short duration! DMT is one of the most powerful psychedelics known. DMT and Ayahuasca can increase blood pressure and heart rate, and can be dangerous to use if you have a heart condition or high blood pressure. While DMT can produce self-insight, it can also exacerbate preexisting mental illnesses. As with all psychedelics, ‘set’ and ‘setting’ are important factors in determining whether someone has a positive or negative experience. “Set” is the mental state a person brings to the experience—their thoughts, mood and expectations. “Setting” is the physical and social environment in which the drug is consumed. Being in a good mental state with trusted friends in a supportive environment when using DMT reduces the risk of having a difficult trip. Always remain seated or lying down when smoking DMT, and always have a “sitter” (someone sober whose job it is to watch over you during the experience). Despite its natural presence in the human body as well as thousands of plant species, DMT is a Schedule 1 controlled substance and possession with or without intent to distribute can carry long prison sentences. Be self aware! If you choose to use DMT, having an intention is the best way to maximize the benefits and reduce the risks. DMT is a good listener of the user’s intention, and the drug often responds accordingly.